In the spirit (pun intended) of the season, is is appropriate to look at one of the patrons of the dead. 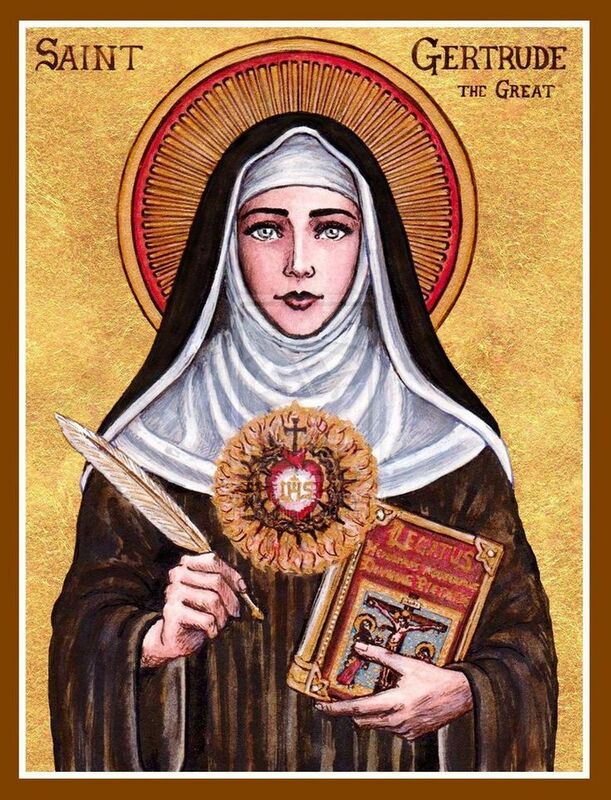 Saint Gertrude was a powerhouse when it came to the faithfully departed. Read on to find out more about her and the powerful prayer she wrote to help those in purgatory! Gertrude of Helfta was born January 6, 1256 in Eisleben, Thuringia. When she was 5 years old, she was sent to the Cistercian monastic school in Saxony called Helfta. From that point forward, she would forever be associated with that name. Her study habits were second to none and she surpassed her fellow students quickly. Since her time was devoted to study, Christ took a backseat to her efforts in education. She became proficient in philosophy, literature, singing, and miniature painting, but noticed that something was still missing. Soon, she fell deeply and madly in love with Christ and the idea of a life lived fully with and in Him. She made the decision to enter the novitiate and took the veil. However, all was not roses. At about age 24, she was only living her life as a nun half-heartedly, easily distracted from where her attention should have been. A crisis developed within her being and overtook her. She was lost, lonely, and depressed. All of the plans she had made for herself began to crumble. Early in 1281, she experienced Jesus through a youth who said to her, “I have come to comfort you and bring salvation.” She would later write of that day in reflection, “Jesus, my Redeemer, you have lowered my indomitable head to your gentle yoke, preparing for me the medicine suited to my weakness.” From that point forward, her life was lived in radical conformity and union with Christ. Her studies shifted to only the study of Scripture, the writings of the Church Fathers, and theological works. She truly became a theologian via her new focus. As a result, she wished what she was learning to be shared with others. She began to write short treatises and works for her fellow sisters. These became spiritual treasures to those who were fortunate enough to read them. Many souls were edified by these works as a result. Gertrude experienced many mystical experiences where Jesus would reveal His infinite love and charge her to spread it among the faithful. He was especially adamant she spread His message to those suffering and for sinners. She would write these mystical experiences down to effect that end. Finally sometime in late 1301 or early 1302, Gertrude succumbed to her infirmities. She would forever be joined to the eternal Bridegroom in ecstasy. She had a true devotion to the Sacred Heart of Jesus. Gertrude is the only female saint with the appellation “the Great” in recognition of her theological insight and depth. Her feast day is November 16th. St. Gertrude the Great, ora pro nobis!